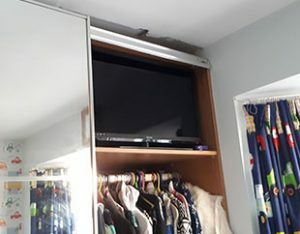 Flat Screen TV mounted on quality brackets with hidden cables. Cables are routed to your entertainment centre where we can also site your surround sound system, wiring the cables out of sight to create an amazing finish to your entertainment system. We understand you may not have the space or time to transport any new TV equipment and as such, so long as the equipment is to be collected from an outlet in York, we offer a pick up service for your equipment as part of the installation. 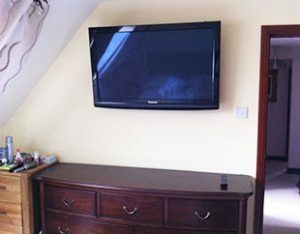 If you would like AdHocHandyMan to install your Flat Screen TV in your home, please email us or call 07878 256771 to book a visit and a no obligation quote. Whether or not you use trunking depends on a couple of factors: Cost and looks. Most people use trunking to conceal the unsightly cables which fall down underneath the wall mounted TV. There are many different colour options available to match the decor of the room. With careful planning, the impact of trunking can be minimised. Concealed cables are cables which are run through the stud wall or into the wall plaster. This finish is better looking to most however this finish does produce a lot more work and therefore cost. 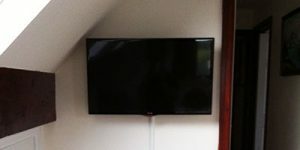 Speak to us about a no obligation quote on mounting your tv to a wall. 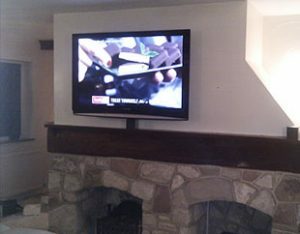 A sample of the Tv’s we have mounted. To see more work, please visit our latest projects pages.